The groundwork is already laid for America’s next war(s) in the Middle East and, in the process, one of the last relatively undamaged areas of Syria (at least before the Turkish military began to pound it with air strikes and artillery, then moving in tanks) is about to be added to the rubble of the region. The damage that began with the U.S. invasion of Iraq in 2003 could now spread to yet another country, Turkey, already filled with Syrian refugees but relatively unscathed so far. At the moment, an autocratic Turkish president, angry over American backing for Kurdish forces in northern Syria and jockeying for popularity in his own country, is potentially repeating on a small scale the American blunder of 2003. He’s blithely invading Kurdish-controlled parts of northern Syria, assuming that all will go splendidly, while President Trump’s military finds itself, as it has so many times in these years, between a rock and a hard place. The U.S. has approximately 2,000 troops in northern Syria and, as Secretary of State Rex Tillerson only recently announced, they are slated to stay there not just until the last ISIS fighter is wiped off the face of the Earth, but possibly until the end of time (a decision for which the Trump administration naturally has no congressional sanction). Washington’s latest stated goal: to support Kurdish fighters in the region and play a role in undermining both Bashar al-Assad’s regime in Syria and its Iranian backers. (Good luck with that!) Those troops now find themselves caught between NATO ally Turkey (which has let Washington use a key military base against ISIS) and American-trained and -armed leftist Syrian Kurds, who have done most of the hard fighting (and dying) against the Islamic State “caliphate.” The Turks, who consider those Kurds “terrorists” (and backers of longtime Kurdish insurgents in Turkey), are angrily demanding that all U.S. troops immediately and unconditionally leave the Kurdish-controlled Syrian city of Manbij before they move in militarily (a demand already rejected by the head of U.S. Central Command). And oh, yes, the remnants of ISIS, driven back and no longer a “caliphate” or much of anything else, are still fighting. So much for Donald Trump’s “victory” in Syria. While no one can possibly know what will come of all this, as with so much else in American war-making over these last 17 years, it’s reasonable to assume that it won’t be good, or peaceable, or end particularly well, or possibly at all. Count on one thing: you won’t soon read about an American military unchallenged and victorious in a Syria brought to order. Quite the opposite: if recent years are any indication, the damage will only spread, more civilians will die, more homes will be destroyed, more populations will be uprooted, and embittered locals, angry at the U.S. among other participants in this mayhem, will be primed to join yet newer terror groups. Whether the rationale is the need to wage a war on terror involving 76 countries or renewed preparations for a struggle against peer competitors Russia and China (as Defense Secretary James Mattis suggested recently while introducing America’s new National Defense Strategy), the U.S. military is engaged globally. A network of 800 military bases spread across 172 countries helps enable its wars and interventions. By the count of the Pentagon, at the end of the last fiscal year about 291,000 personnel (including reserves and Department of Defense civilians) were deployed in 183 countries worldwide, which is the functional definition of a military uncontained. Lady Liberty may temporarily close when the U.S. government grinds to a halt, but the country’s foreign military commitments, especially its wars, just keep humming along. As a student of history, I was warned to avoid the notion of inevitability. Still, given such data points and others like them, is there anything more predictable in this country’s future than incessant warfare without a true victory in sight? Indeed, the last clear-cut American victory, the last true “mission accomplished” moment in a war of any significance, came in 1945 with the end of World War II. As soon as he took office, however, he promptly appointed a set of generals to key positions in his government, stored the mothballs, and went back to war. Here, then, is a brief rundown of the first year of his presidency in war terms. In 2017, Afghanistan saw a mini-surge of roughly 4,000 additional U.S. troops (with more to come), a major spike in air strikes, and an onslaught of munitions of all sorts, including MOAB (the mother of all bombs), the never-before-used largest non-nuclear bomb in the U.S. arsenal, as well as precision weapons fired by B-52s against suspected Taliban drug laboratories. By the Air Force’s own count, 4,361 weapons were “released” in Afghanistan in 2017 compared to 1,337 in 2016. Despite this commitment of warriors and weapons, the Afghan war remains — according to American commanders putting the best possible light on the situation — “stalemated,” with that country’s capital Kabul currently under siege. How about Operation Inherent Resolve against the Islamic State? U.S.-led coalition forces have launched more than 10,000 airstrikes in Iraq and Syria since Donald Trump became president, unleashing 39,577 weapons in 2017. (The figure for 2016 was 30,743.) The “caliphate” is now gone and ISIS deflated but not defeated, since you can’t extinguish an ideology solely with bombs. Meanwhile, along the Syrian-Turkish border a new conflict seems to be heating up between American-backed Kurdish forces and NATO ally Turkey. 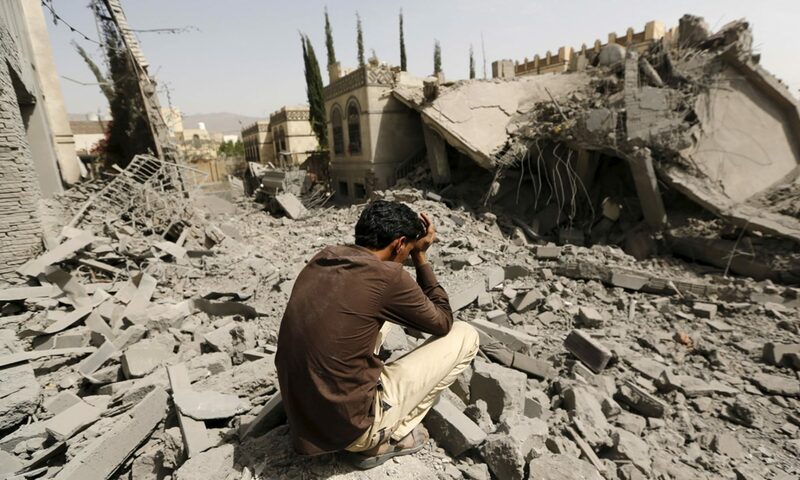 Yet another strife-riven country, Yemen, witnessed a sixfold increase in U.S. airstrikes against al-Qaeda on the Arabian Peninsula (from 21 in 2016 to more than 131 in 2017). In Somalia, which has also seen a rise in such strikes against al-Shabaab militants, U.S. forces on the ground have reached numbers not seen since the Black Hawk Down incident of 1993. In each of these countries, there are yet more ruins, yet more civilian casualties, and yet more displaced people. Finally, we come to North Korea. Though no real shots have yet been fired, rhetorical shots by two less-than-stable leaders, “Little Rocket Man” Kim Jong-un and “dotard” Donald Trump, raise the possibility of a regional bloodbath. Trump, seemingly favoring military solutions to North Korea’s nuclear program even as his administration touts a new generation of more usable nuclear warheads, has been remarkably successful in moving the world’s doomsday clock ever closer to midnight. Clearly, his “great” and “powerful” military has hardly been standing idly on the sidelines looking “big” and “strong.” More than ever, in fact, it seems to be lashing out across the Greater Middle East and Africa. Seventeen years after the 9/11 attacks began the Global War on Terror, all of this represents an eerily familiar attempt by the U.S. military to kill its way to victory, whether against the Taliban, ISIS, or other terrorist organizations. With the very word “peace” rarely in Washington’s political vocabulary, America’s never-ending version of war seems as inevitable as anything is likely to be in history. Significant contingents of U.S. troops and contractors remain an enduring presence in Iraq and there are now 2,000 U.S. Special Operations forces and other personnel in Syria for the long haul. They are ostensibly engaged in training and stability operations. In Washington, however, the urge for regime change in both Syria and Iran remains strong — in the case of Iran implacably so. If past is prologue, then considering previous regime-change operations in Afghanistan, Iraq, and Libya, the future looks grim indeed. The question today for the American people: How is the dominant military power of which U.S. leaders so casually boast to be checked? How is the country’s almost total reliance on the military in foreign affairs to be reined in? How can the plans of the profiteers and arms makers to keep the good times rolling be brought under control? No peacenik MacArthur. Other famed generals like Smedley Butler and Dwight D. Eisenhower spoke out with far more vigor against the corruptions of war and the perils to a democracy of an ever more powerful military, though such sentiments are seldom heard in this country today. Instead, America’s leaders insist that other people judge us by our words, our stated good intentions, not our murderous deeds and their results. Whether in Iraq, Afghanistan, or elsewhere in the war on terror, the U.S. is now engaged in generational conflicts that are costing us trillions of dollars, driving up the national debt while weakening the underpinnings of our democracy. They have led to foreign casualties by the hundreds of thousands and created refugees in the millions, while turning cities like Iraq’s Mosul into wastelands. 1. Abandon the notion of perfect security. You can’t have it. It doesn’t exist. And abandon as well the idea that a huge military establishment translates into national safety. James Madison didn’t think so and neither did Dwight D. Eisenhower. 2. Who could have anything against calling the Pentagon a “defense” department, if defense were truly its focus? But let’s face it: the Pentagon is actually a war department. So let’s label it what it really is. After all, how can you deal with a problem if you can’t even name it accurately? 3. Isn’t it about time to start following the Constitution when it comes to our “wars”? Isn’t it time for Congress to finally step up to its constitutional duties? Whatever the Pentagon is called, this country should no longer be able to pursue its many conflicts without a formal congressional declaration of war. If we had followed that rule, the U.S. wouldn’t have fought any of its wars since the end of World War II. 4. Generational wars — ones, that is, that never end — should not be considered a measure of American resolve, but of American stupidity. If you wage war long, you wage it wrong, especially if you want to protect democratic institutions in this country. 5. Generals generally like to wage war. Don’t blame them. It’s their profession. But for heaven’s sake, don’t put them in charge of the Department of “Defense” (James Mattis) or the National Security Council (H.R. McMaster) either — and above all, don’t let one of them (John Kelly) become the gatekeeper for a volatile, vain president. In our country, civilians should be in charge of the war makers, end of story. 6. You can’t win wars you never should have begun in the first place. America’s leaders failed to learn that lesson from Vietnam. Since then they have continued to wage wars for less-than-vital interests with predictably dismal results. Following the Vietnam example, America will only truly win its Afghan War when it chooses to rein in its pride and vanity — and leave. 7. The serious people in Washington snickered when, as a presidential candidate in 2004 and 2008, Congressman Dennis Kucinich called for a Department of Peace. Remind me, though, 17 years into our latest set of wars, what was so funny about that suggestion? Isn’t it better to wage peace than war? If you don’t believe me, ask a wounded veteran or a Gold Star family. 8. Want to invest in American jobs? Good idea! But stop making the military-industrial complex the preferred path to job creation. That’s a loser of a way to go. It’s proven that investments in “butter” create double or triple the number of jobs as those in “guns.” In other words, invest in education, health care, and civilian infrastructure, not more weaponry. 9. Get rid of the very idea behind the infamous Pottery Barn rule — the warning Secretary of State Colin Powell offered George W. Bush before the invasion of Iraq that if the U.S. military “breaks” a country, somehow we’ve “bought” it and so have to take ownership of the resulting mess. Whether stated or not, it’s continued to be the basis for this century’s unending wars. Honestly, if somebody broke something valuable you owned, would you trust that person to put it back together? Folly doesn’t decrease by persisting in it. 10. I was an officer in the Air Force. When I entered that service, the ideal of the citizen-soldier still held sway. But during my career I witnessed a slow, insidious change. A citizen-soldier military morphed into a professional ethos of “warriors” and “warfighters,” a military that saw itself as better than the rest of us. It’s time to think about how to return to that citizen-soldier tradition, which made it harder to fight those generational wars. Isn’t it time to stop praising our troops to the rooftops and thanking them endlessly for what they’ve done for us — for fighting those wars without end — and to start listening to them instead? Isn’t it time to try to understand them not as “heroes” in another universe, but as people like us in all their frailty and complexity? We’re never encouraged to see them as our neighbors, or as teenagers who struggled through high school, or as harried moms and dads. Our troops are, of course, human and vulnerable and imperfect. We don’t help them when we put them on pedestals, give them flags to hold in the breeze, and salute them as icons of a feel-good brand of patriotism. Talk of warrior-heroes is worse than cheap: it enables our state of permanent war, elevates the Pentagon, ennobles the national security state, and silences dissent. That’s why it’s both dangerous and universally supported in rare bipartisan fashion by politicians in Washington. So here’s my final point. Think of it as a bonus 11th suggestion: don’t make our troops into heroes, even when they’re in harm’s way. It would be so much better to make ourselves into heroes by getting them out of harm’s way. Be exceptional, America. Make peace, not war. William Astore, a retired lieutenant colonel (USAF) and history professor, is a TomDispatch regular. He blogs at Bracing Views.